The wearable Musical Gloves enable you to play various forms of music on virtually any surface. This exciting wireless system is built around an MC13192 SARD board’s MC9S08GT60 MCU, MC13192 transceiver, and MMA6261Q (x- and y-axis) and MMA1260D (z-axis) accelerometers. The gloves are instrumented with fingertip switches and the three axis accelerometers. The system tracks finger presses, which start and stop notes, and hand motion, which determines the loudness and octave of each note. 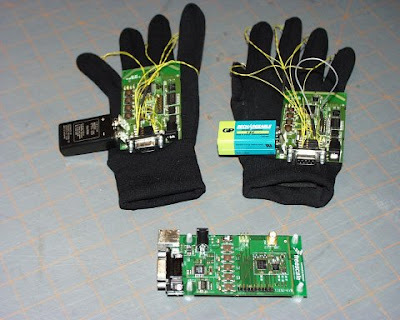 The Musical Gloves are connected via a wireless RF connection to a host PC, which processes the finger presses and accelerometer readings in order to control the musical output. This project created and build by Steve Kranish.